Welcome to Day #6 of Chocolate and Africa Theme Week. Through chocolate, we're taking a virtual voyage through the equatorial belt of Africa, traveling from east to west. For the past several days, we've sampled several chocolates made from cacao grown in Madagascar cacao. This week, we explore chocolates made with Tanzanian cacao. 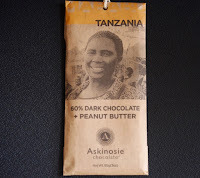 Shaun Askinosie, founded Askinosie Chocolate with a social mission in mind. 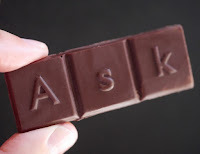 For example, instead of leaning on mostly anonymous cacao farmers in lesser developed countries for the lowest possible cacao prices, Askinosie features them on every bar. The emphasis is on "Real people. Real places." Today's 60% Dark Chocolate + Peanut Butter bar was made using cacao grown, harvested and fermented by people in (Mababu) Tanzania like lead farmer Mama Mpoki (whose smiling face adorns the packaging surrounding this bar). This bar had a creamy, thick, nut butter texture, with a subtle dark chocolate fudge aroma and a very subtle peanut butter flavor. It was lower in fruit/acid than last week's made of Madagascar bars that were popping with classic red berry notes associated with that region.